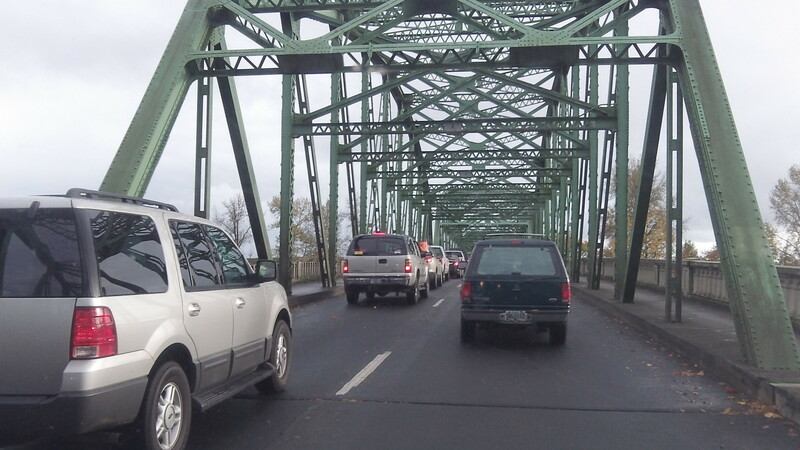 Unlike in Corvallis, no protesters closed this bridge into Albany. Suppose someone had tried? I’m glad I wasn’t in my truck trying to cross the Willamette River on the Van Buren Street Bridge in Corvallis Saturday. Demonstrators claiming to protest police brutality around the country blocked the bridge for “more than 15 minutes,” as the Gazette-Times reported. If the drivers prevented from crossing the bridge had been the impatient kind, one wonders what might have happened. Nobody was arrested, the paper reported. That seems odd. You can now block the only direct exit from town toward the interstate highway system and not be held responsible? Here’s what I’m wondering. What if a driver at the front of the blocked column of vehicles had an urgent appointment that Saturday afternoon? Or what if she had to get to a bathroom right away and could not risk just sitting in a traffic jam for who knew how long? Would such drivers have been justified in nosing ahead slowly and pushing demonstrators out of the way with their front bumpers? If a protester refused to move and got run over, would the driver be charged with something? Or would the injured demonstrator have to answer for obstructing traffic, broken legs or no? Or what if someone got into a fender bender because the bridge was blocked? Could he try to recover damages from the protest organizers, assuming they could be identiied and served with a summons? The 1st Amendment is a cherished right and I’d gladly oppose any attempt to silence a protester. If I where accused of a crime and my fate were in the hands of a jury, a grand jury or a seated jury at trial, the very last people I would want on that jury are the protesters. They completely ignore the role and responsibility of a juror; to listen to all the evidence presented and THEN make a determination. The protesters prove what is wrong with a prejudiced view of others and the detrimental effects it has on our society. If law abiding citizens wanted to block and use a public roadway for a particular time, they should have applied for a parade permit (or some lawful equivalent). Absent a permit, they should have been rounded up and removed from the roadway and cited/fined accordingly. It’s my opinion that our “freedom of speech” to protest as depicted recently on the TV has been grossly abused. You may wish to voice your opinion or opposition & gather supporters to re-enforce your point. Paramount above all though is my “right” for non-intrusive speech and my “right” of freedom of movement. Your right to act out carries a responsibility to not restrict the right’s that another person has. Depriving someone else of their right to come and go as they please is just WRONG!